This is a question I have been asked over and over for the last 5 months since we made our traveling plans known. These last 5 months have flown by. There has been so much organizing, selling, painting, preparing and planning going on that I sometimes just stop and have to remember to breathe. Every now and then I’ll find myself trying to think about what it will be like when we are actually out of the house and living everyday in our 5th wheel. But it’s hard. I’ve never slept in a 5th wheel let alone stayed in one, ever. This is a whole new experience for our family. We’ve never pulled a 42 foot trailer behind a truck. We’ve never tried to cram 6 people’s belongings into a 420 sqft space. Would you sell most all of your belongings not knowing what the future holds? Would you uproot your family from everything they’re used to? Would you trade in your comfortable 2700 square foot home for 420 square foot trailer? Would you sell your two vehicles and buy a truck to pull your home behind you? Would you set out on the road not knowing where you’ll end up? If this isn’t scary to you, you’re braver than I am. Am I excited? Heck yes! Am I scared? Heck yes! But you know what? I’d rather be scared and on an adventure than sit in my roomy house looking at all the useless crap I have to dust. We were living the American Dream. We had money in the bank, we had everything we really wanted. But you know what? There has always been this uneasy feeling deep down. Like we were missing something. Like there was something more. We know we are made to do more. We are made to create. We are made to help people. We are made to share our stories, and we are made to make a difference. And now, we’re on that journey. To remove all the distractions so we can find out what exactly we are made for. What do we create? Who do we help? Who wants to hear what we have to say? And how do we make a difference in this world? I don’t know the answers, but I am showing up, everyday. We’re throwing away our American Dream, and we’re choosing to wake up! 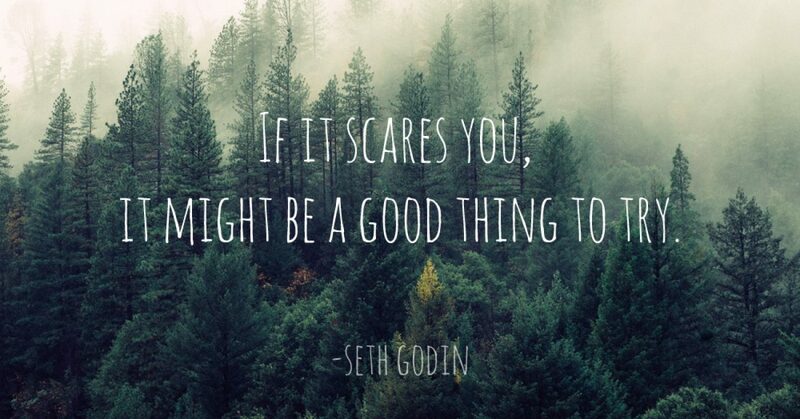 If you have a dream that both scares you and excites you, you should probably go with it! Don’t worry about the details. They always have a way of working out. Make the decision to live out your dream, otherwise you’ll wake up 35 years from now and regret not trying. Here’s to waking up, going against the grain and fighting the fear. Let’s do it!